Mass-producing garments gets old quickly, even if the whole process is a fast one. For a nice break in the mundane-ness, I hand-sewed a felt toy kit for Jenna for the airplane. I'd seen these dough cut-out cookies on many sites in the past, but none of them inspired anything other than an "oh, cute". Then, recently, I saw Destri's tutorial on The Mother Huddle, and I knew I should (and could) do it for the trip to Singapore. It was the perfect antithesis to - and balm for - all that efficient, productive, pedal-flooring at the machine: slow, bit-by-bit hand-stitching at nights, enjoying the making as well as the product. I'll speed through the deconstruction, not only because I didn't stop to take in-progress photos, but also because Destri's tutorial is fabulous in itself. 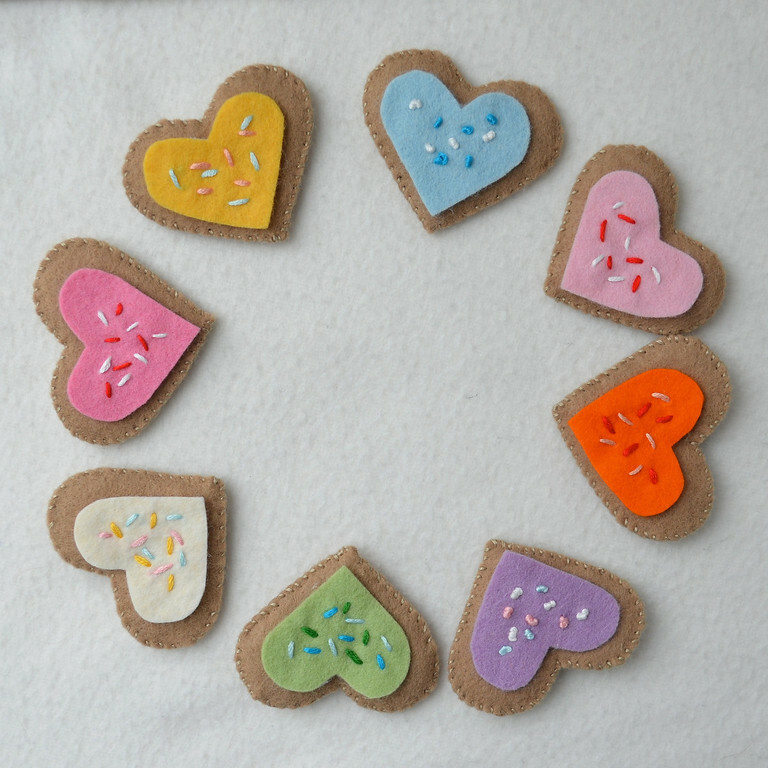 Here is the cookie dough rolled flat - it is two sheets of felt with cookie shapes cut out and their borders whip-stitched together. 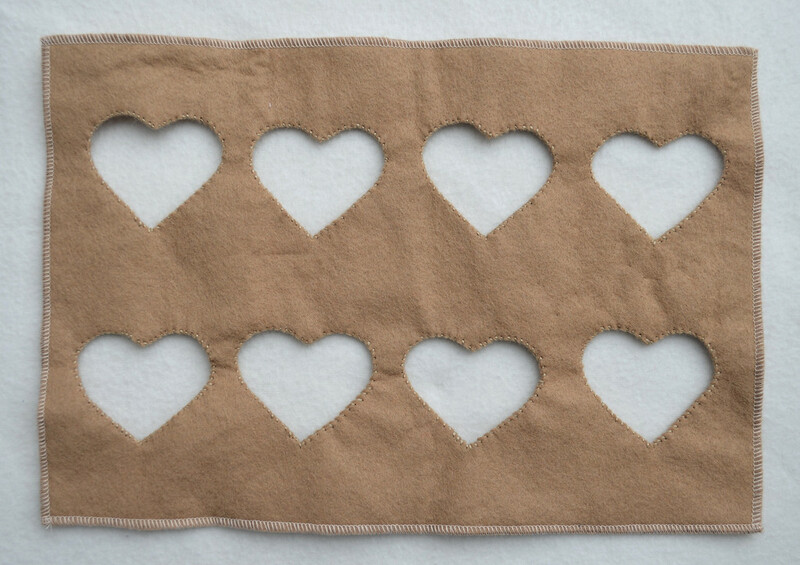 The cut-out hearts were whip-stitched as a sandwich with a layer of fleece between each pair. and fusible fleece ironed onto their backsides, so they cling to the cookies. Kate snuck out of bed one night and caught me sewing the sprinkles. She guessed immediately what they were, and the next day whispered in my ear, "Are we going to tell Jenna about the cookies?" (No, not yet, Kate!) Good thing she's good at keeping secrets. I added a little piping bag - because the girls are into piping bags now - which is a quadrant of a circle sewed into a cone and tied at the top. To keep the tip stiff and nozzle-like, I ironed a small piece of fusible interfacing (craft weight, aka craft fuse) on the wrong side of the fabric, at the tip of the cone, before sewing it up. That little rolling pin was from Michaels, for $1 (or 60cents, with our coupon). I made a little drawstring sack-of-flour-ish bag. I can't wait to see Jenna's face when she opens the bag, thousands of feet up in the sky. Edited March 2018 to add: A reader just notified me that the Destri's tutorial can no longer be found at the link above, so I'm tagging on some instructions to the end of this post so you can still DIY this project yourself. Find a cookie cutter to use. 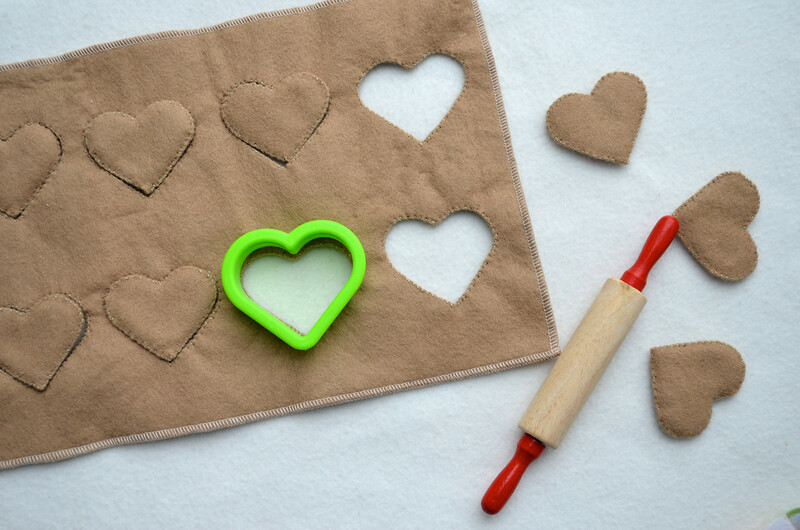 This cookie cutter will be your template-maker. 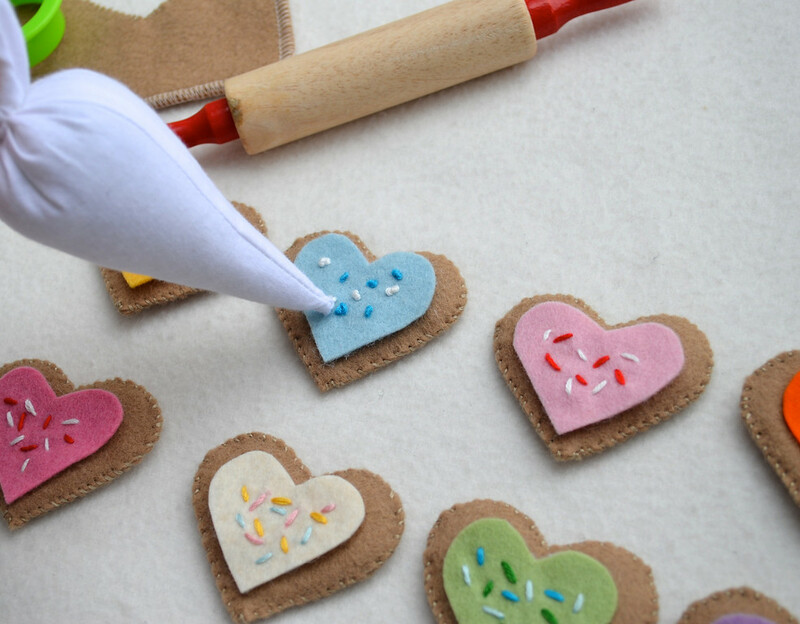 Measure out a sheet of felt for the dough that's large enough to fit the number of cookies you want. In my project, this was 8 cookies. Cut out TWO sheets of felt in this size. Position the cookie cutter on ONE sheet of dough and trace around it where you want the cookie-cut-outs to be. 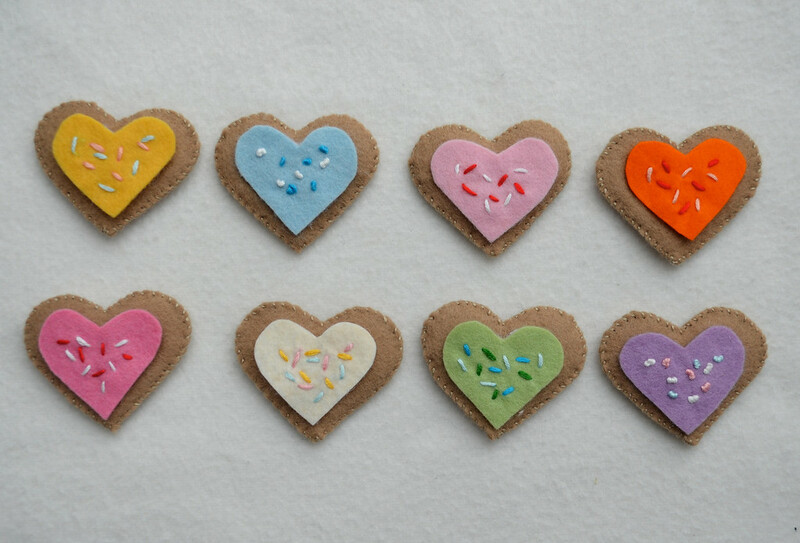 Carefully cut out all the cookies and save them - you'll be sewing them into the actual cookies later. Place this sheet of dough on the second (whole) sheet and line up their straight edges. Pin in place and using the cookie-windows of the first sheet, trace the outlines of the windows on the second sheet underneath. Unpin the sheets and carefully cut out the windows in the second sheet. You will now have two sheets with windows and a bunch of cookie shapes. These cookie shapes will fit exactly in the holes now, but after they've been stitched into cookies, they might be a little snug. So we'll need to either trim the cookies or enlarge the windows slightly. Just a little, though - 1 to 2 mm all around, max. Now pin the sheets together and line up the windows. Blanket stitch around each pair of windows, binding the two sheets together around the windows in the process. When all the windows are stitched together, stitch the edges of the two dough rectangles together, trimming any edges askew as necessary. The dough is finished - set aside and work on the cookies now. Take two cookie shapes and place them together. 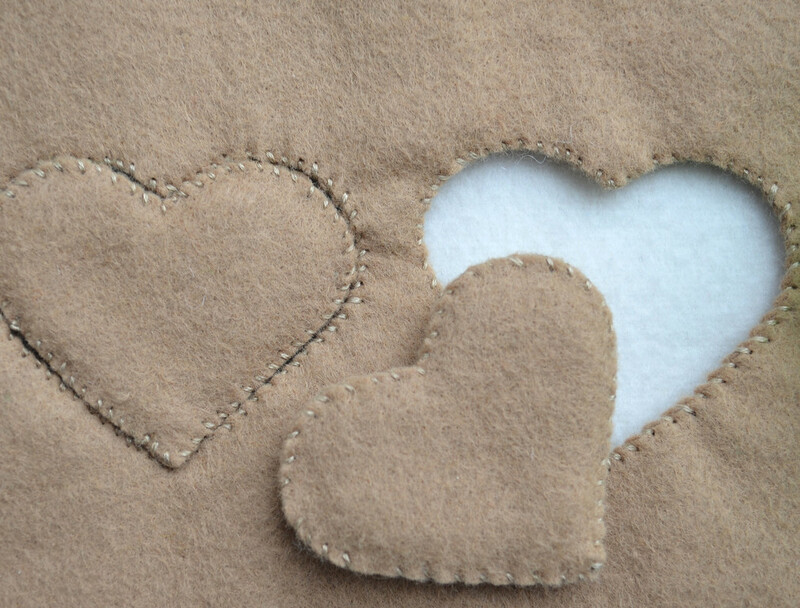 Blanket stitch around the edge, filling it with a thin layer of stuffing or batting (or even a piece of puffy fabric like fleece) to give it a thickness but not make it puffy. Repeat to complete all the cookies. The cookies are finished - set aside. 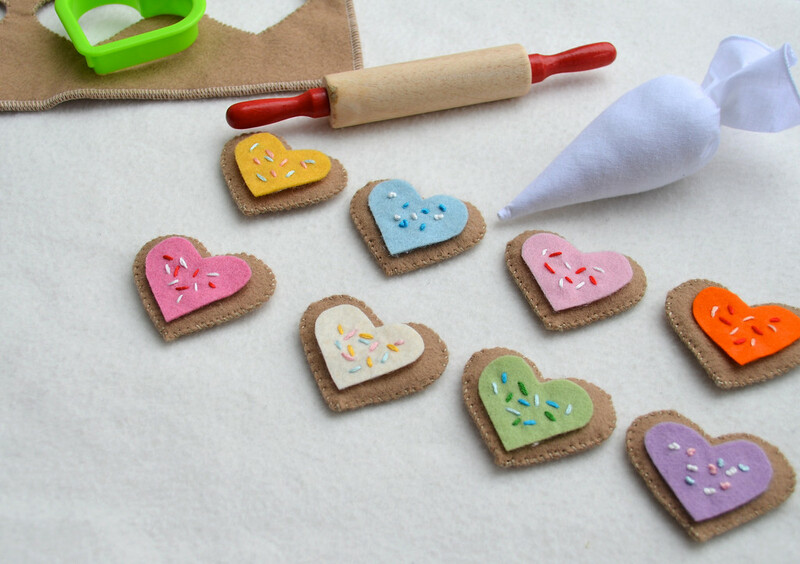 Using the cookie cutter, make a template for the frosting pieces - trace around the cutter outline, then trim away enough all around to make a template that's the same shape but smaller. 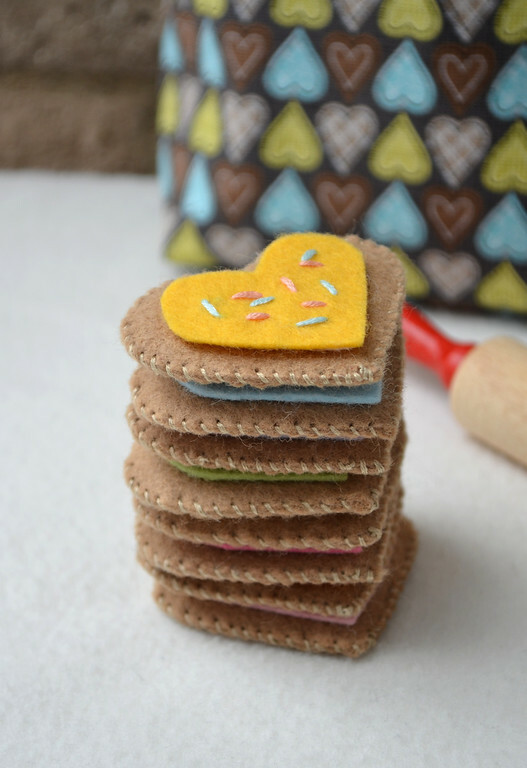 Cut out frosting pieces from felt. 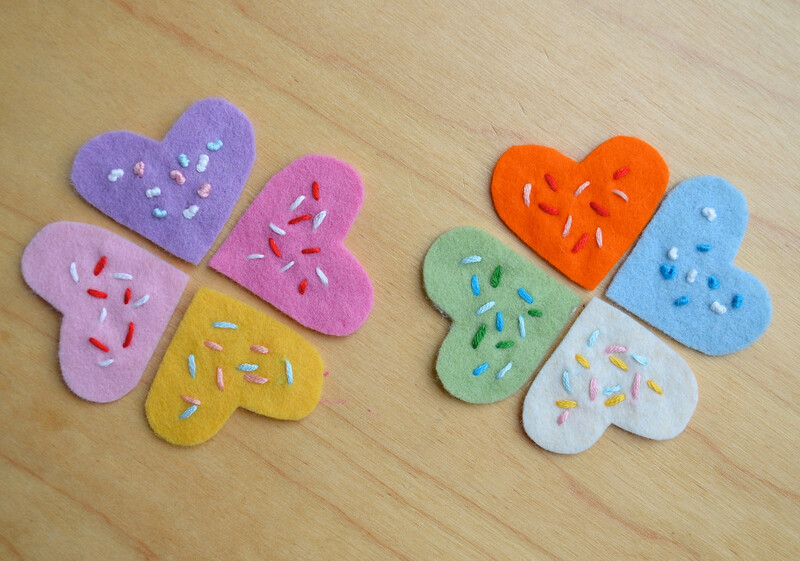 Embroider sprinkles on the RS of each piece of felt. 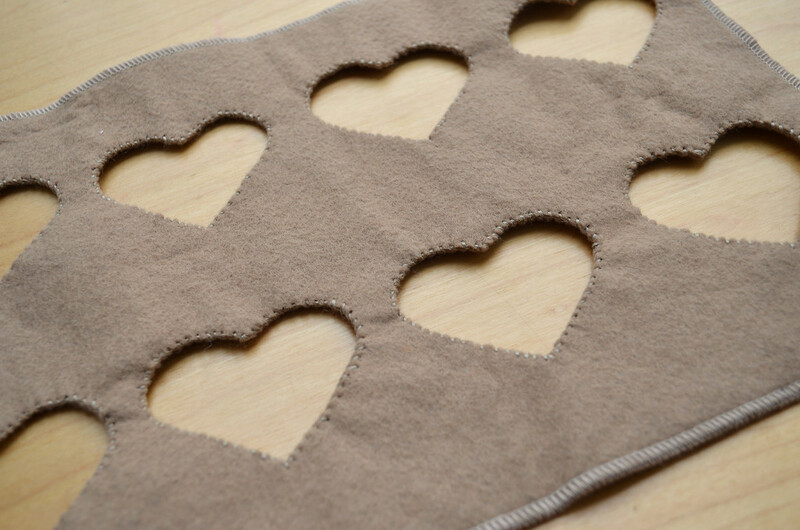 Cut out pieces of fusible fleece (buy from JoAnn or any fabric store) that are a little smaller than the frosting pieces and iron them to the WS of the frosting pieces. The frosting pieces are now finished. Oh they look good enough to eat ! My 5 year old would love this. I love this. I saw the tutorial before Christmas but never got around to it. I love your version. Hope the girls love it too. Have you discovered File Folder Games for the older girls. You use manilla folders and cut out bits and they are really easy to carry and use on planes, car trips etc. Oh, so CUTE!! I can see where it'd be a fun break from all the garment sewing. I hope Jenna is thrilled (how could she not be?)! 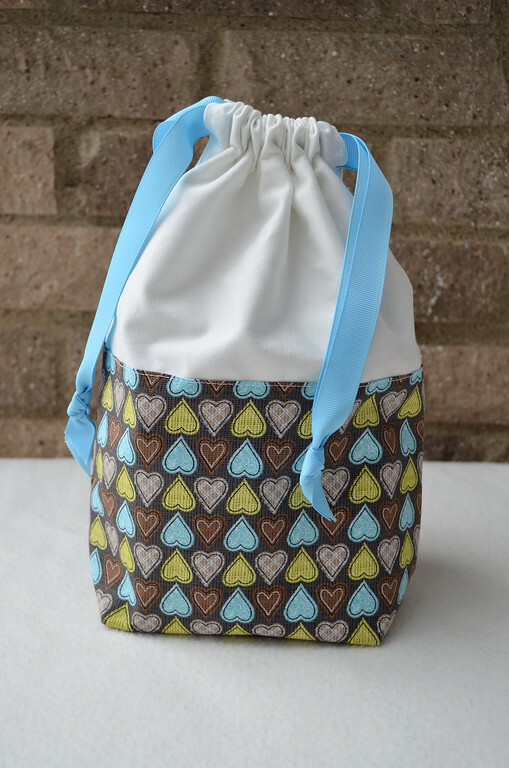 Even a "hearty" bag to keep them in... perfect! You have GOT to be kidding me with that piping bag. I love to come here because you just blow my mind sometimes. This is so sweet. What a fun mum you are- such lucky little girls! I wish my boys would be into that- what a great, great project! ohhhh!! this is on my to do list and has been for ages!! My son loves his kitchen and he got a baking kit for Christmas, so I was supposed to do it for Christmas! I love that you even made the icing bag! I never comment on blogs, but this is too cute for words! I love your blog and look at it every day! Thank you for all the inspiration! Wow! Your creativity amazes me. These are totally adorable! That is simply adorable! I am enthralled by all the wonderful things on your site! so happy I found you! Oh wow! This is so amazing! I am going to try my best to get this together for my wee girl...and maybe figure out some cupcakes to go along with. Thanks so much for sharing! glorious! love it, may even try it! how charming!!! I especially love the "dough sheet" and the piping bag. Good enough to eat! Oh oh oh...the cuteness! Looks so much fun (and yummy...)! 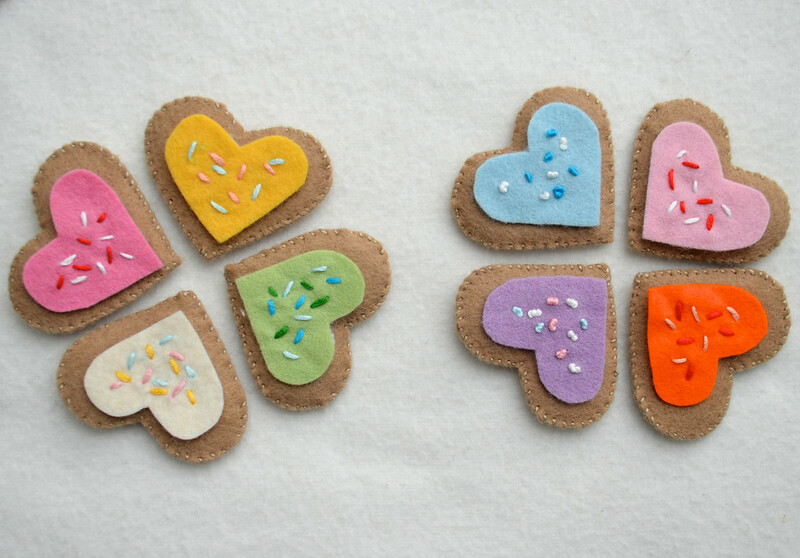 May I know which fusible fleece did you use for the cookies? There are so many types and this is my first time using fusible fleece. Thank you. I'd never bought fusible fleece before, till I needed it for this project. The shop I went to had only one kind. I didn't know there were other types. The one I bought is PELLON (brand) Fusible Fleece. There is some kind of item number on the label - 987F. Hopefully that helps. Hope you find the right kind! These look absolutely fabulous!! :) Thanks for sharing! 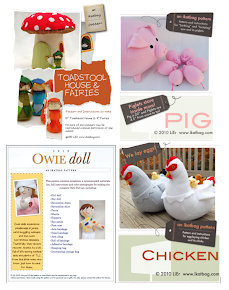 I think I'll make one for my daugther -and they'd make great little girl's gifts too! :) I've pinned this and can't wait to have a go! Love this. 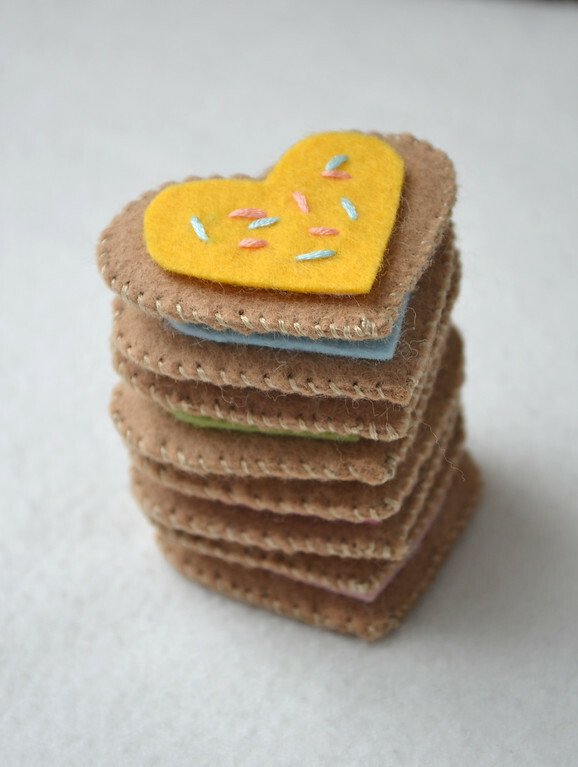 As the sewing contributor for Making the World Cuter, I'm featuring this in a Valentine's Day Roundup posting soon. :) http://makingtheworldcuter.com/ Hopefully it will bring lots of traffic your way. 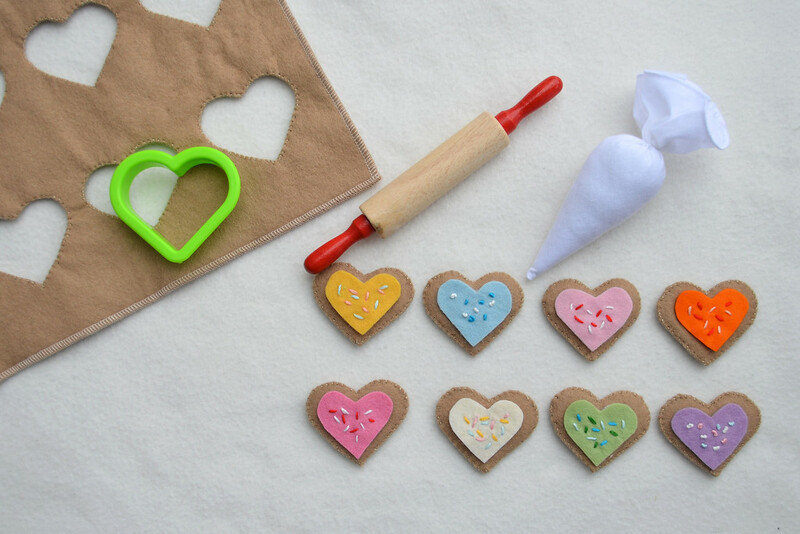 Where did you find the little plastic cookie cutter? Erin: It was a playdoh thing we had in the house. Thanks for this wonderful tutorial ! I am looking for something to do with the grandkids ! and I found it ! Thanks for sharing. This is sooooo cute!! 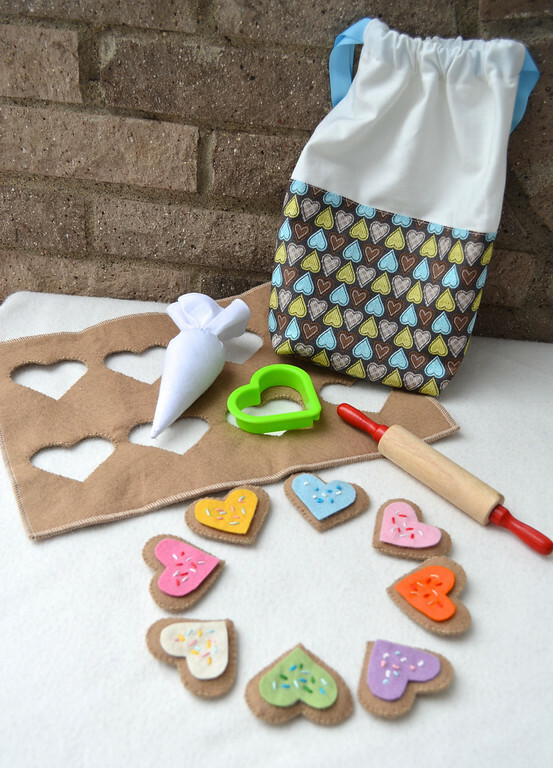 Do you have a pattern for the piping bag? Oh my gosh! These are so stinkin' cute. I can't wait to make them for my daycare. Adorable! Will make for the grandchildren. Amy: I just checked the link and you're right, Destri's tutorial isn't there any more. What a pity. 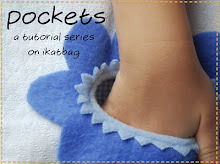 Unfortunately no, I don't have a pattern because it was adapted from Destri's tutorial, but I'll add some instructions at the end of the post so you (and other readers) can still DIY this!